This page is dedicated to Compton organs that sadly no longer exist mainly as a result of church closures or being replaced by other instruments. St Mark's Church, Worsley, Manchester - Series 4 replaced by a 3 manual pipe instrument. Tilehurst Methodist Church, Reading - Miniatura model replaced by Makin digital. Booker Methodist Church, High Wycombe - Miniatura model. Church now closed and fate of organ unknown. Kingswinford Methodist Church, West Midlands - 363 model replaced in 2002 by a Wyvern digital. Organ now in private ownership. Vicar Street Methodist Church, Dudley, West Midlands - 363 model. Church now closed. Fate of organ unknown. Church of the Ascension, Wall Heath, West Midlands - CH2 model replaced by a Viscount digital. Organ believed scrapped. Springdale Methodist Church, Wolverhampton - unknown model replaced by Eminent digital. Stowlawn Methodist Church, Bilston, West Midlands - Sonatina replaced by a Yamaha. Organ scrapped. Bethel Methodist Church, Cannock, Staffordshire - replaced by an electronic keyboard. Fate of organ unknown. Bourne Methodist Church, Heath Hayes, Staffordshire - replaced by a digital hymn machine. Fate of organ unknown. King Edward Grammar School, Stourbridge, West Midlands - 347 model replaced by a Viscount digital. Fate of organ unknown. Bromyard Road Methodist Church, Worcester - Cantata model replaced by Eminent digital. Organ believed to be in a village hall. Kingston-upon-Thames Methodist Church - 363 model replaced by Wyvern digital. Fate of organ unknown. St John's United Reformed Church, Orpington, Kent - 347 model replaced with pipe organ. Console re-used for pipe organ. All Saint's Church, Highgate, London - 347 model replaced by digital of unknown make. Organ now in private ownership. Norton Canes Methodist Church, Staffordshire - CH2 model replaced by digital hymnal. Fate of organ unknown. Stockton Methodist Church, Warwickshire - CH2 model. Church now closed - fate of organ unknown. Chessington Methodist Church, Surrey - 347 model replaced by Allen digital. Fate of organ unknown. Wheelwright Lane Methodist Church, Coventry - 357 model. Church closed - organ now in private ownership in France. Wesley Methodist Church, Radcliffe, Manchester - 357 model replaced by Makin digital. Organ now in private ownership in North Wales. Lane Head Methodist Church, Willenhall - CH2 model replaced by a second hand pipe organ. Fate of organ unknown. Kenton Methodist Church, London - 363 model replaced by Allen digital. Fate of organ unknown. Christadelphian Hall, Southport - Sonatina model replaced by Viscount digital. Organ scrapped. St Andrew's Methodist Church, Leeds - 357 model replaced by Gem digital. Organ believed scrapped. Hesketh Bank Methodist Church, Southport - 357 model replaced by digital hymnal. Fate of organ unknown. Northolt Methodist Church, London - 357 model replaced by Johannus digital. Fate of organ unknown. Southend-on-Sea Crematorium, Essex - 363 model replaced by digital unknown make. Organ believed to be in private ownership. Holy Trinity Church, Baswich, Stafford - 357 model replaced by second hand pipe organ. Fate of organ unknown. West London Crematorium - CH2 model in one chapel and 347 model in other chapel both replaced by Viscount digitals. Fate of both instruments is unknown. Falmouth Methodist Church, Cornwall - 347 model replaced by Allen digital. Fate of organ unknown. Bilston Methodist Church, West Midlands - 357 model replaced by Makin digital. Organ removed and sold to private owner by Makins. Roman Catholic Church, Kilsyth - 357 model replaced by digital of unknown make. Removed and currently in storage by the Scottish Cinema Organ Trust. Immanuel Baptist Church, Southsea - 347 model replaced by Rodgers digital. Organ believed scrapped. Edgeley Methodist Church, Stockport - 357 model replaced by Johannus digital. Fate of organ unknown. Rotofon still in situ. Cantley Methodist Church, Doncaster - 357 model replaced by digital electronic of unknown make. Fate of organ unknown. Balby Road Methodist Church, Doncaster - Sonatina model removed when church closed. Now in private ownership. Robin Hood Crematorium, Solihull - CH2 model replaced by digital electronic of unknown make. Fate of organ unknown. Lodge Hill Crematorium, Birmingham - 3 manual special series model replaced by Makin digital. Fate of organ unknown. Masonic Hall, Windsor - 357 model replaced by an Eminent digital. Southend-on-Sea Crematorium, Essex - 363 model replaced by digital electronic of unknown make. Organ believed to be in private ownership. St Joseph's Catholic Church, Anderton, Chorley - unknown model but had rotofon speaker. Replaced in 2007 by digital electronic of unknown make. Fate of organ unknown. St Teresa's Catholic Church, Darlington - 357 model replaced by a Johannus digital. Hythe United Reformed Church, Kent - unknown model replaced by Eminent digital. Pett Methodist Church, West Sussex - Cantata model replaced by Yamaha clavanova. Blenheim Crescent Baptist Church, Luton - unknown model replaced by digital piano. St Mary's Church, Whipsnade, Dunstable - CH2 replaced by Rodgers digital. Fate of organ unknown. Maidenhead United Reformed Church - unknown model replaced by Copeman Hart digital. 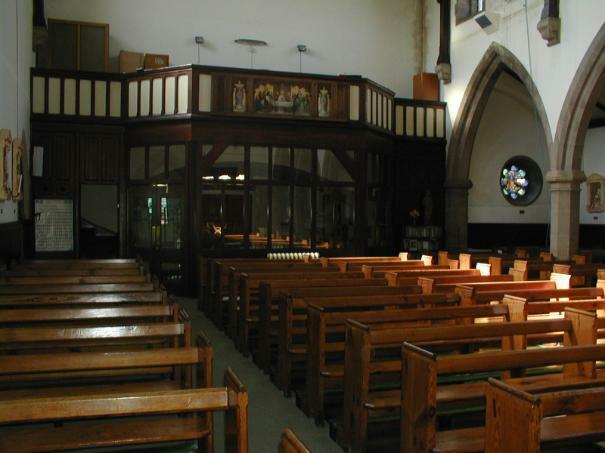 Our Lady of the Visitation, Greenford - 357 model replaced with Viscount digital electronic. St John's Church, Castlerigg, Cumbria - 357 model replaced with digital of unknown make. Beecroft Uniting Church, Sydney, Australia - 357 model replaced with pipe organ. Orpington United Reformed Church, Kent - 348 model replaced with pipe organ. Church of Christ, Brisbane, Australia - 357 model replaced by digital electronic. All information of known Compton installations no longer around would be most appreciated! St Joseph's Catholic Church, Anderton, Chorley, Lancashire with the rotofon speaker seen in view on the rear gallery. The Compton organ was replaced in 2007 by a digital instrument. Kingswinford Methodist Church near Dudley, West Midlands with the rotofon speaker of the 363 model installed there for the new church in 1966 where it remained until 2001 when it was replaced by a Wyvern digital. This organ was put up for sale and is now in private ownership.